We take stock Vicidial and make it auto configuring and easy to install. WarmConnect Dialers use Windows OS, so no need to hire Linux administrators. Inhouse dialer maintains a Hosted twin dialer that it updates every 20 minutes as a backup. Switch between Inhouse and its hosted twin as your requirements change. Test drive the dialer with our free hosted demo. WarmConnect Inhouse dialers are designed to be easy to install. They use Windows 8 OS, so no need to hire Linux administrators. They have a hosted "twin" that allows you flexibility to switch between inhouse and hosted flavors. You can start with hosted, and then take the dialer inhouse with automatic migration of calling data. You can also switch back to hosted when facing trouble with the inhouse dialer! Inhouse dialers are free, with many optional services from WarmConnect to make your life easier. The same dialer you demo at our site is available as a download for you to install. We take stock Vicidial® and make its installation a breeze. The dialer is auto-configuring allowing for fast startup. We ease hiring administrators by using Windows OS. Taking it inhouse lets you integrate inhouse software or PSTN lines. We offer minutes for your inhouse dialer. USA & Canada at USD0.0099/minute, 6 second billing. Full helpdesk support for dialer with our telephony services. Single tenanted for maximum regulatory compliance. Softphone and head set for each agent. Use Zoiper®. Its free! Hardphone for each agent as alternative for Softphone. Hardphone = ata or channel bank + dial pad + headset. Predictive Dialers dial more lines than there are agents, because most calls are not answered or land in voice mail. Predictive dialing thus uses much more bandwidth than manual dialing. 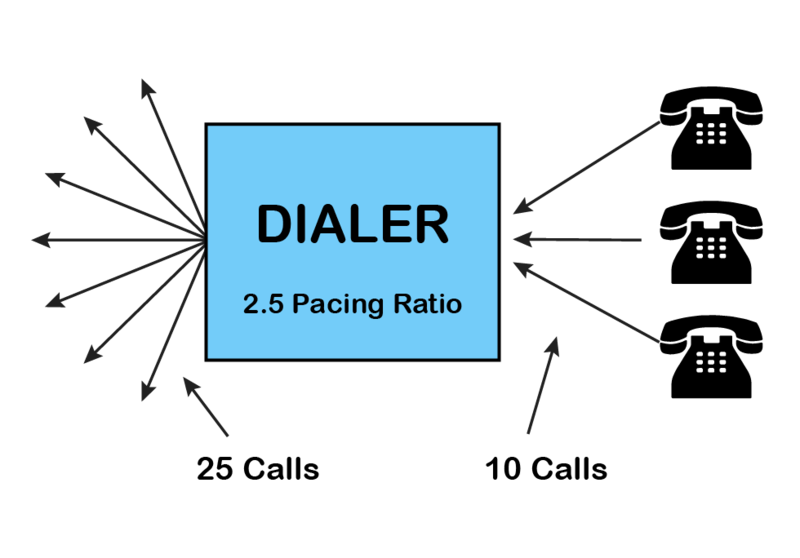 The ratio of lines dialed to agents is called pacing ratio in dialer terminology. If pacing ratio is 2.5, and you have 10 agents, the dialer will dial 25 calls simultaneously. This is explained in the diagram. If the dialer is in your premises, you must cater to bandwidth for 25 calls, whereas if it is hosted, you need to cater to just 10 calls. You can continue with the hosted dialer till you arrange for the requirements listed here. Once requirements are in place, download the dialer and install. The Inhouse dialer automatically downloads your data from its hosted twin. Every 20 minutes, the Inhouse dialer uploads data to its hosted twin as a backup.